This is a guest column by two old friends and baseball savants. 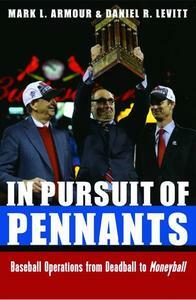 Mark Armour and Dan Levitt wrote the fine article below to give “Our Game” readers a taste of their forthcoming book, In Pursuit of Pennants–Baseball Operations From Deadball to Moneyball. It will be published this month (March 2015) by the University of Nebraska Press (for more, see: http://goo.gl/QFqb8E). This is Mark and Dan’s second book as a team, following Paths to Glory (Potomac, 2003); each is an award-winning and prolific researcher and writer. Mark (Twitter handle @markarmour04) received SABR’s Henry Chadwick Award–the “Chaddie,” the baseball researcher’s highest honor–in 2014. Dan was a finalist for the Seymour Medal in 2009, for Ed Barrow: The Bulldog Who Built the Yankees’ First Dynasty.